A PORTION OF THE PROCEEDS FROM THIS BOOK WILL GO TO JAPAN DISASTER RELIEFA major literary sensation is back with a quietly stunning tour de force about a young woman who falls for a cult escapee.While The Lake shows off many of the features that have made Banana Yoshimoto famous—a cast of vivid and quirky characters, simple yet nuanced prose, a tight plot with an upbeat pace—it’s also one of the most darkly mysterious books she’s ever written.It tells the tale of a young woman who moves to Tokyo after the death of her mother, hoping to get over her grief and start a career as a graphic artist. She finds herself spending too much time staring out her window, though ... until she realizes she’s gotten used to seeing a young man across the street staring out his window, too.They eventually embark on a hesitant romance, until she learns that he has been the victim of some form of childhood trauma. Visiting two of his friends who live a monastic life beside a beautiful lake, she begins to piece together a series of clues that lead her to suspect his experience may have had something to do with a bizarre religious cult. 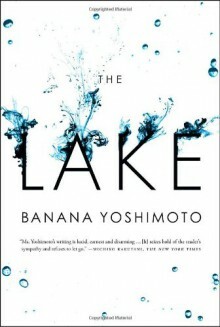 . . .With its echoes of the infamous, real-life Aum Shinrikyo cult (the group that released poison gas in the Tokyo subway system), The Lake unfolds as the most powerful novel Banana Yoshimoto has written. And as the two young lovers overcome their troubled past to discover hope in the beautiful solitude of the lake in the countryside, it’s also one of her most moving.